One day a few weeks ago I was whining to Natalie about my sewing room being a mess. I was frustrated because I was so busy and I was trying to get ready for vacation and trying to finish up some projects and so I was just complaining and feeling overwhelmed. At that point Natalie sat down and said "Mom! 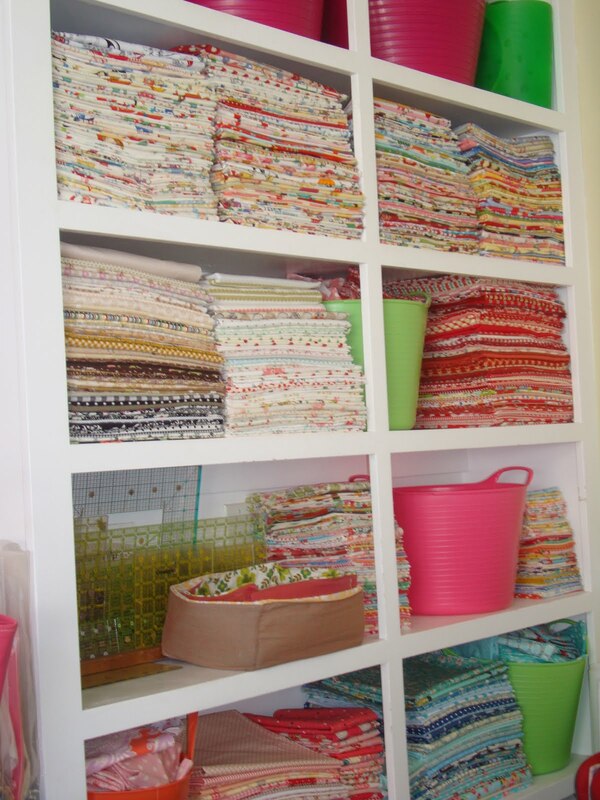 your fabric organization system has failed!". Natalie is my ubber over organized oldest daughter and after the shock of her statement I decided to listen to her (yes, I was that desperate). She told me she would help me reorganize but on one condition. She said I had to listen to her and do exactly what SHE told me to do. 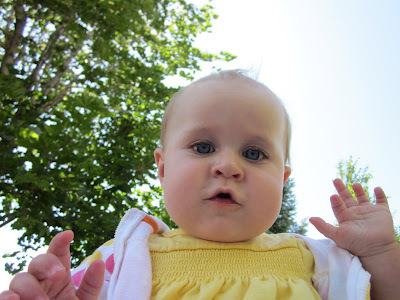 If I hadn't been so overwhelmed at that moment I would have laughed and shoved her out the door. But I was at my wits end and so I gave myself and my precious, lovely fabric over to her completely. 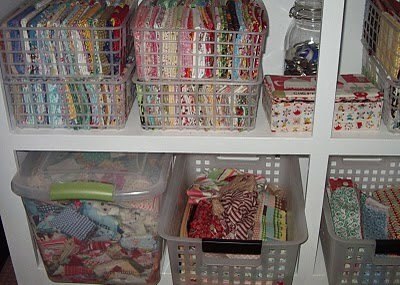 This is a photo (above) of some of my previous ways to organize small pieces of fabric. Fat quarters and smaller were in those see through bins in no particular color or order with other odds and ends underneath in various bins. 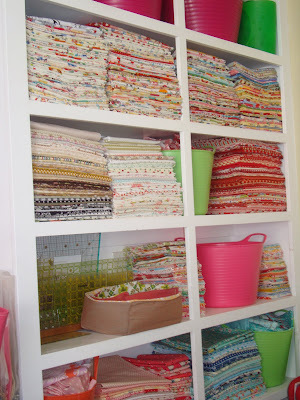 My fabric in larger quantities was folded in no particular order on the shelves with colors assorted all together. I liked the mix of colors together, or so I thought. So Natalie and I took EVERYTHING off the shelves and we went through every single piece of fabric. She made me look at each piece and ask myself if I really wanted it. I did de-stash 2 bags worth. And then we refolded and reorganized everything. 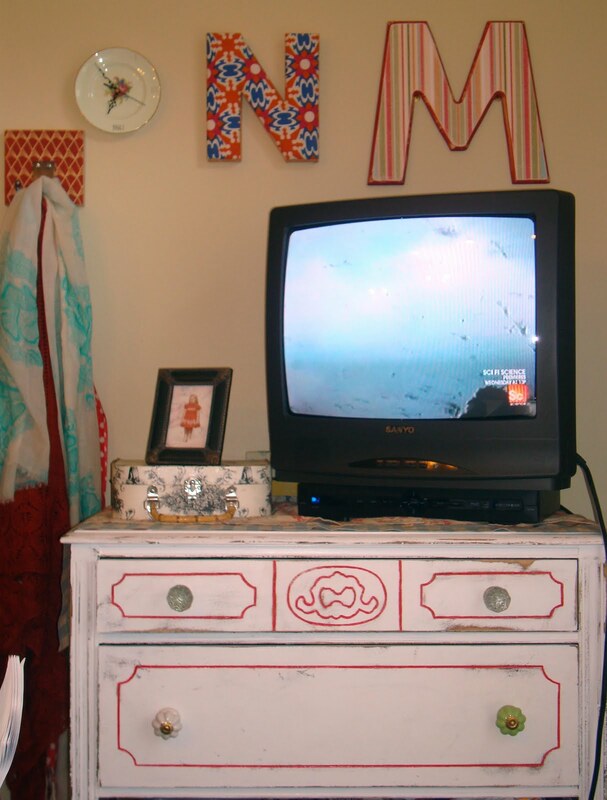 Did I mention how dusty that made my room? 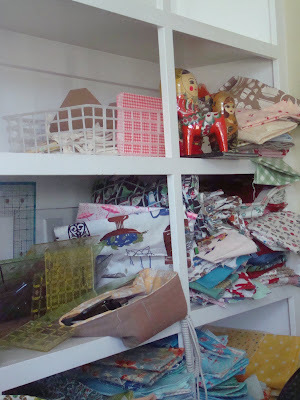 By refolding my fabric to the exact depth of the shelves I was able to give myself more space, too. 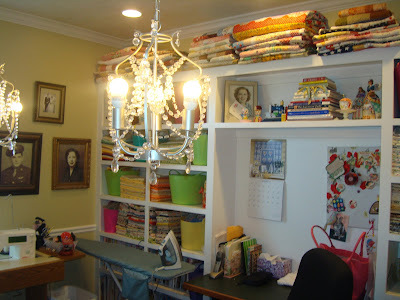 So the room itself may not really look that different but it is much more organized. 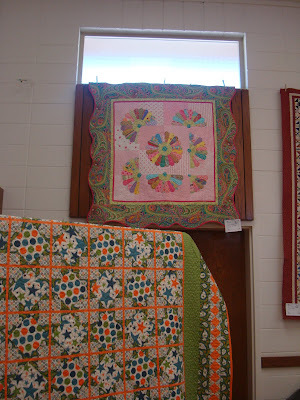 Natalie made different categories of fabric: Blue, Green, Orange, Yellow, Red, Pink/Purple, Neutrals (includes black and brown), Plains, Vintage, Home Dec Weight (and linen) and Novelty. I have 2 shelves with books. 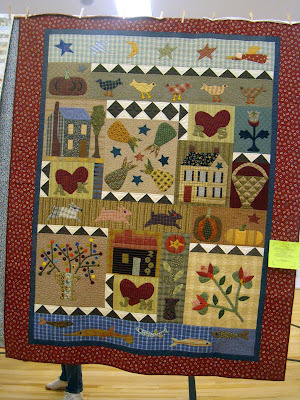 Finished quilts are still on the very top shelf. This is a photo of shelves on one side of the room. The bucket colors have really no relationship to what is inside. But each bucket correlates to a category. Like the green piles have a bucket next to them with green smaller pieces inside. 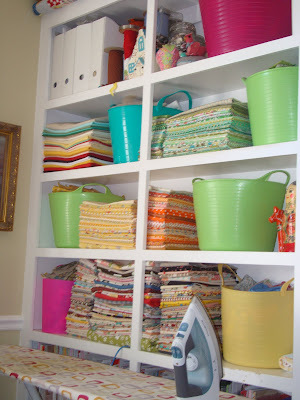 There is also a bucket for trim (big one) on the top shelf (Shelbie and Laurie rolled all my trim and put rubber bands around them.) The mixture of fabric colors on the shelf just by the iron is my home dec weight fabric. The very top shelf here has project buckets to keep my UFO and ongoing projects out of the way and organized since that was part of my problem. 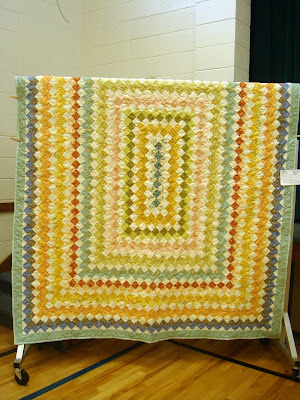 I had projects all over in various stages of finish. These are the shelves on the other side of the room. The bottom shelf has vintage. The next shelf up has red and blue. The next shelf has my lovely collection of tools/rulers and then newer fabric that I need to keep separate to look at (hey that is a category!) After that comes neutral. Above that is novelty and then above that are project buckets. The buckets may not look organized but since they have just one color inside I can go through looking for a color or print and know where it belongs. I used to always make a mess going through the old containers and things were always having to be refolded and sticking up out of the mesh box. This way I can dig deep and go through everything with minimal refolding/fixing. 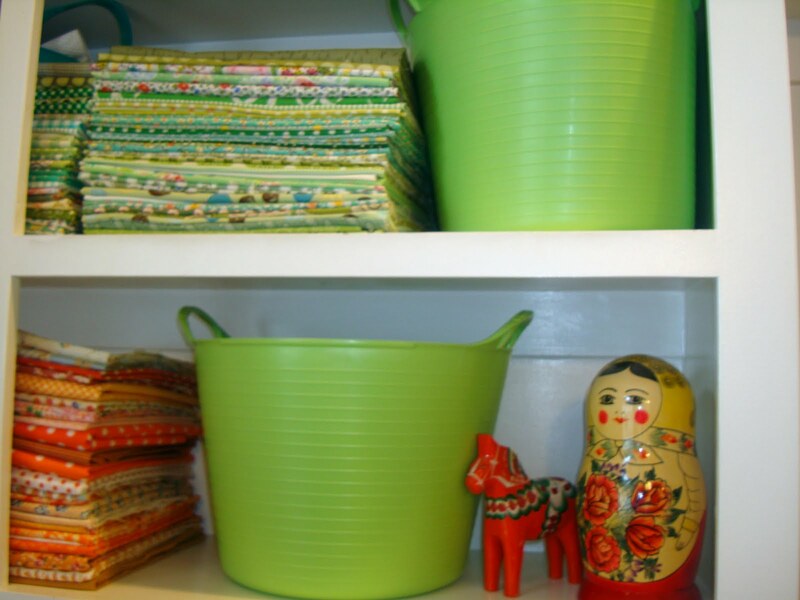 And since it isn't see through you never know just by walking in the room if the buckets are perfect! We started work on the room right before my vacation. So it was left undone. But I've managed to finish things this weekend and I'm feeling very happy with the organization and feeling like I know where everything is stored at. 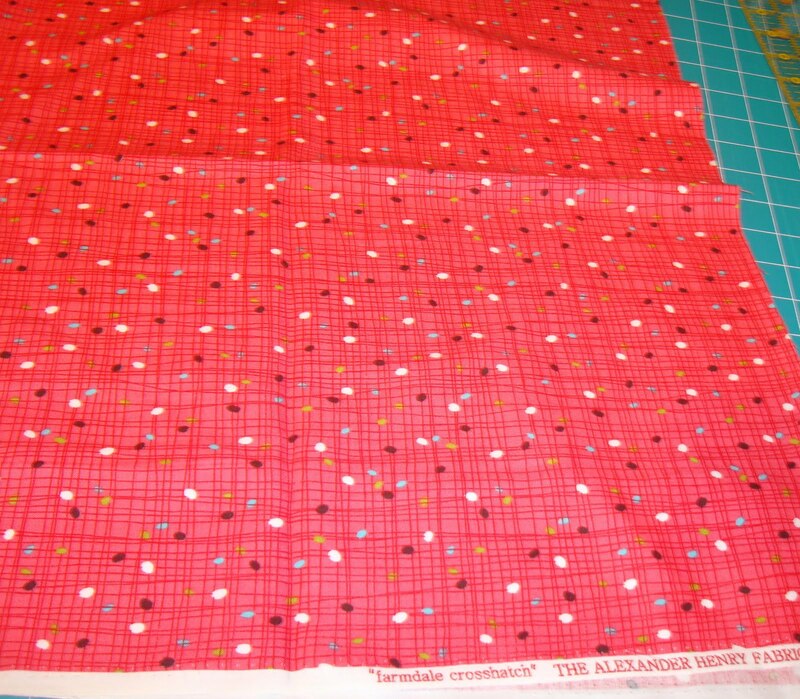 I haven't started sewing yet in the room but I'm really looking forward to it. Thanks Natalie for all your help. I am really happy with it. Even Mr. Hive noticed it looked better! Whew. 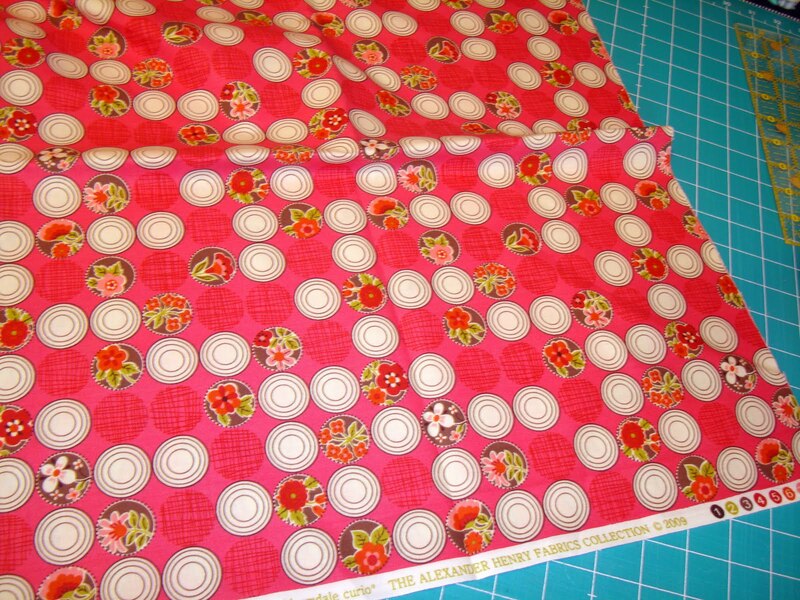 It is after 3:00 PM and I haven't posted fabric Friday yet! But here we go. Busy with so many things, including pattern writing. I'm feeling better but I have a LOT to do this weekend so I need to prioritize myself and energies. I might have to do something I've never done. I might have to dump the more than 1000 blog posts from friends in my Google Reader. I just can't get on top of it. So if you have something you really want me to see, please email me because I just might miss it, unfortunately. I don't like to miss anything. 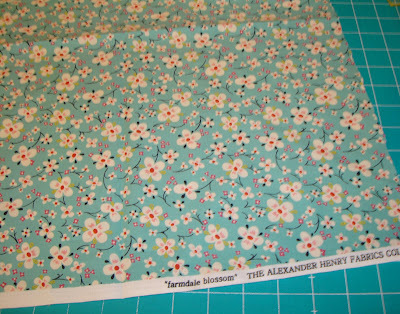 So, have you seen this new Alexander Henry fabric "Farmdale"? It is everywhere but sold out so many places, too. Fabric Worm is having a sale right now. So you might want to check it out there. 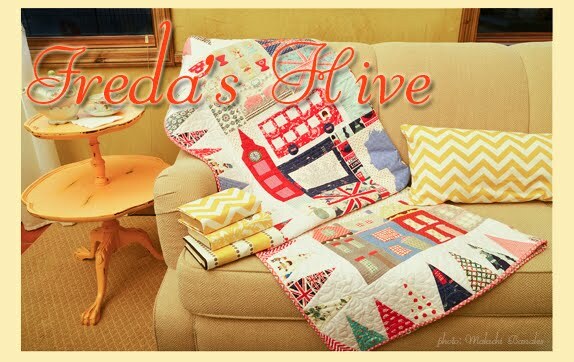 It is a lovely collection and certainly Alexander Henry always impresses. 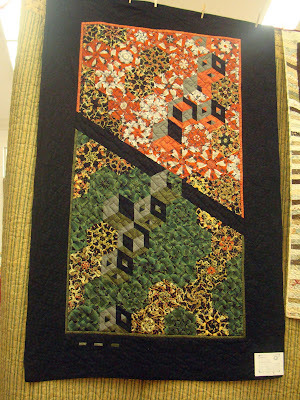 It has a vintage yet modern feel, which I love with a hint of Japanese. 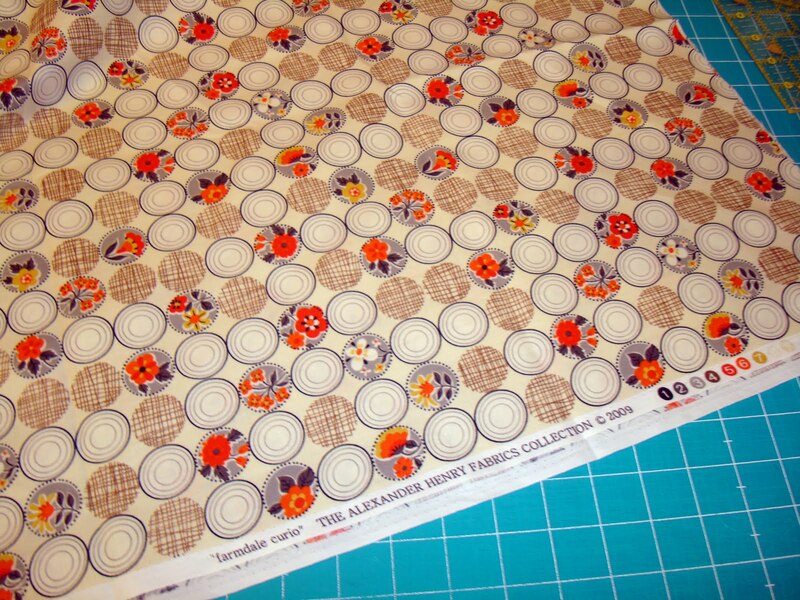 I got a few 1/2 yard cuts of some favorite pieces but I probably will pick up a fat quarter or two more of some of the other prints. I love the colors and designs of each piece. This isn't my favorite in the bunch but I love the color. It has a definite Japanese feel to it. I do love these apples. 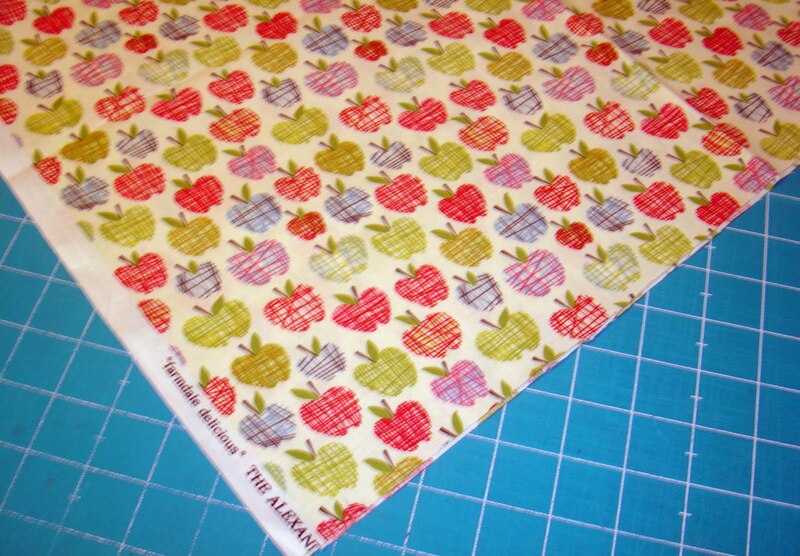 I like the 60s/70s retro feel to the print and I love apple fabrics. 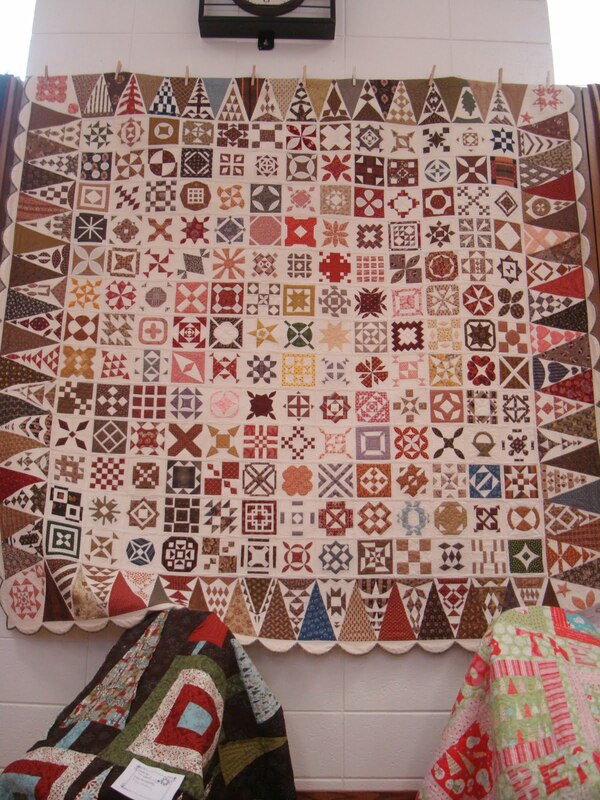 It makes me want to remake this quilt from this book. I have that quilt hanging in my family room. 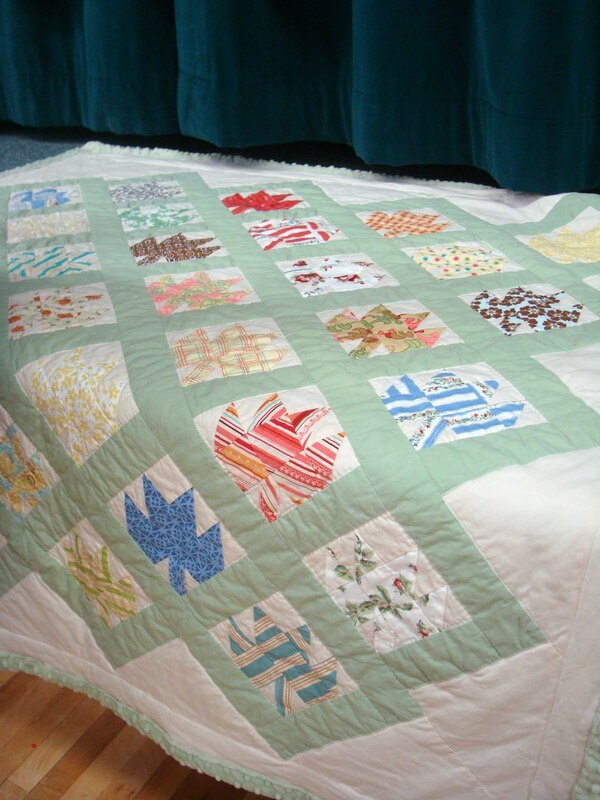 I loved making it. 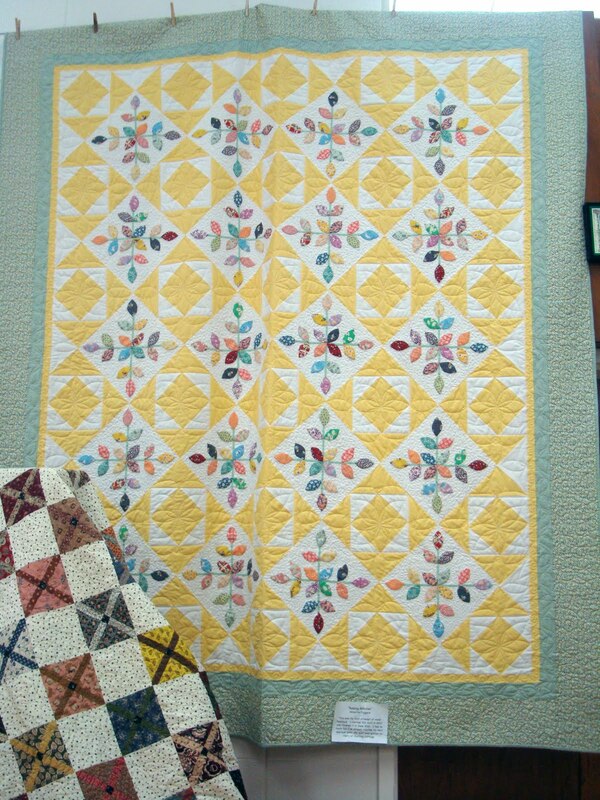 I even want to do a block exchange for it again! 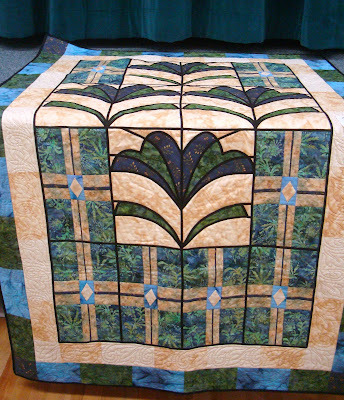 The leaf pattern pieces are in several colorways. I really like the gold color, too. But the pink is fantastic. This is my favorite print in the group. I wish it was offered in different scale. I'd love to have this in a big huge scale print. It is just a charming design. I like this color better than the pink. It is so darling. I want to use it immediately. I want more of it. 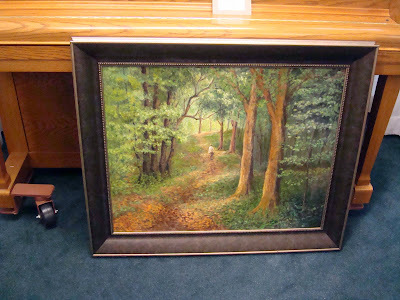 I want it in big and small scale. 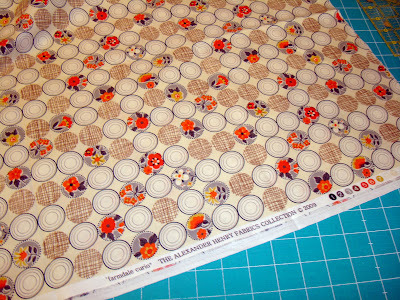 I want to have chairs in this print. I want to make 10 quilts using it this moment. Okay. I'm carried away. But I do really like it. A lot. I'm still working on my studio/sewing room. My shelves are perfect but after all that moving and refolding my room has an inch (well not a full inch but close) of dust everywhere! 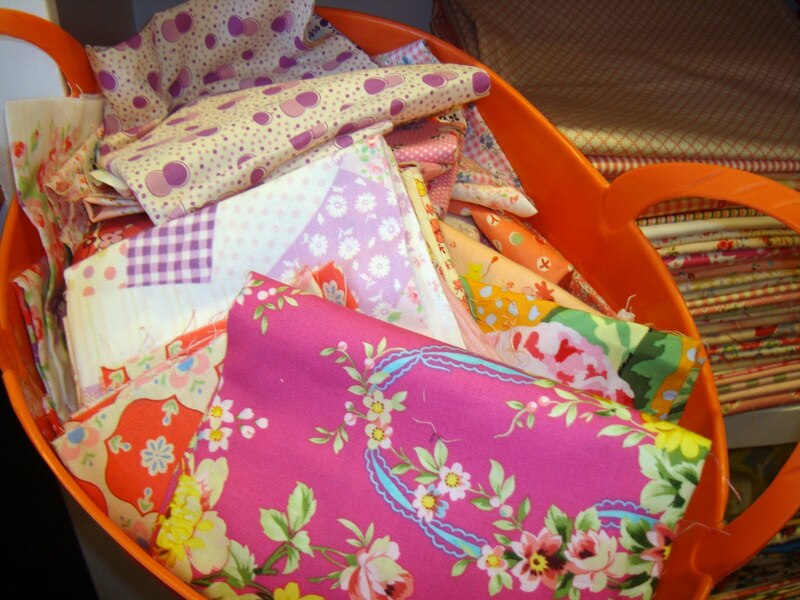 Who knew folding fabric could create so much fabric dust? So I am trying to get the room completed over the weekend. I hope I make it. I wish you were here to help me!! 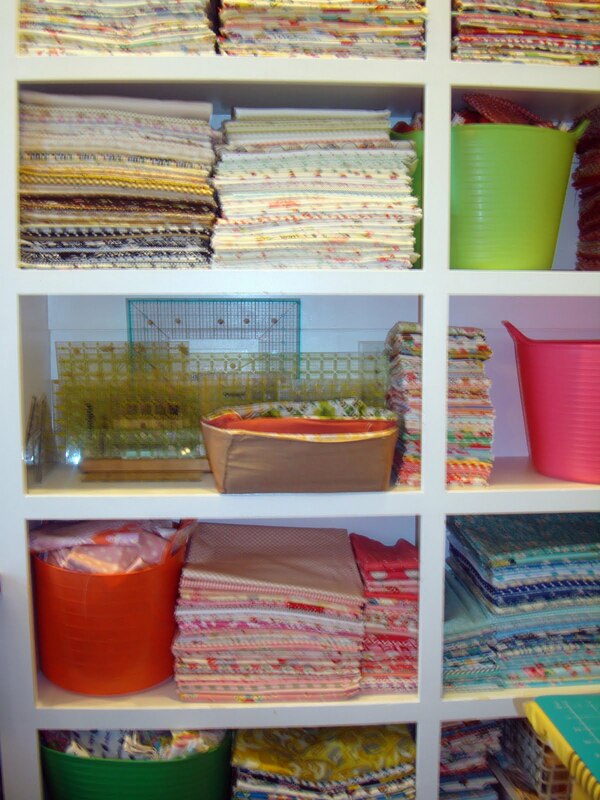 Next week I can show you my new fabric storage system. Cross your fingers that I like the changes. 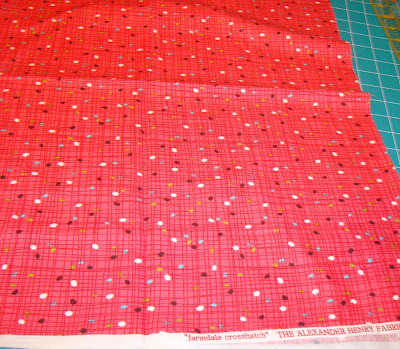 So far I love the perfect look of my fabric all lined up. I just hope I can keep it that way for a while. 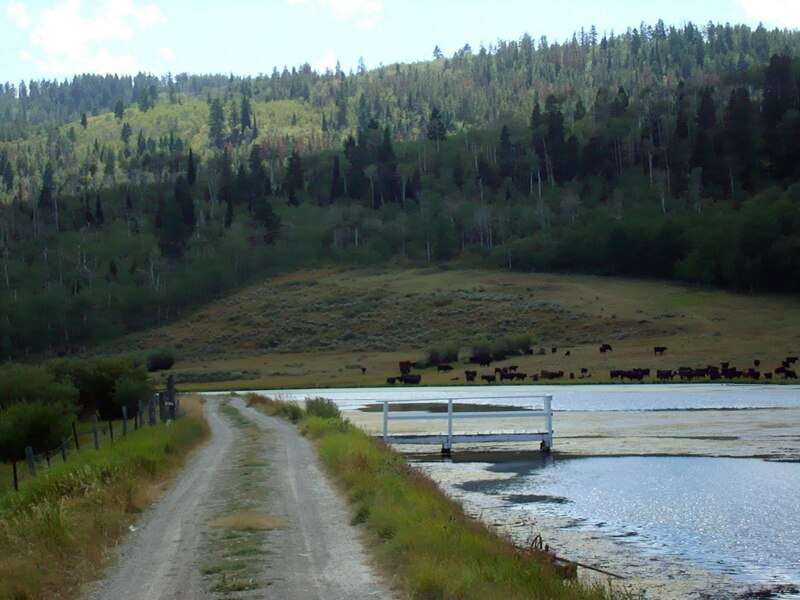 Last week we spent our vacation in Wyoming in beautiful Star Valley at my sister's family ranch. It is an over 800 acre working ranch. 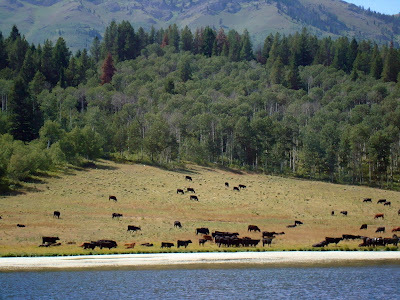 The weather was wonderful and it was so fun to be around family for the week. One of the major attractions for my family is the private lake. 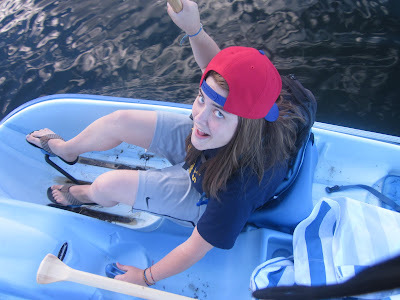 This year we brought a peddle boat with us for the kids to play around in. They had a fantastic time with it in the water. Jamie probably loved the boat the most. Mason fished from the bank and in the boat. 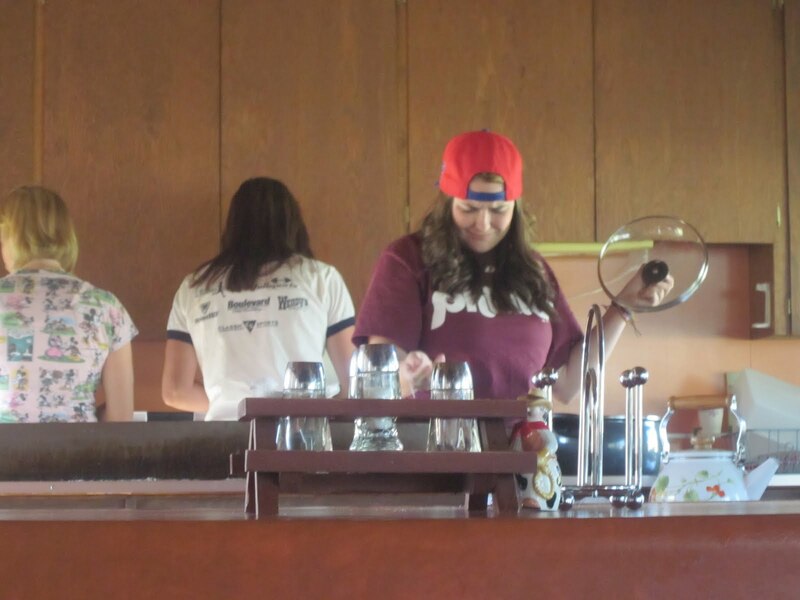 We all eat together in the "cook house" My nieces are doing dishes while Jamie is figuring out what was for dinner. This is the boot collection (obviously) where city folk can borrow boots for horse rides or just for fun. 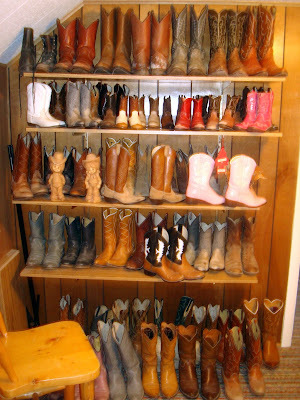 The little kids especially love to pick out boots to use. Speaking of kids, we had little Allison with us last week. Mason helped her jump on the trampoline and she loved it. Usually my sisters and I do some kind of sewing or craft while we are together at the ranch. 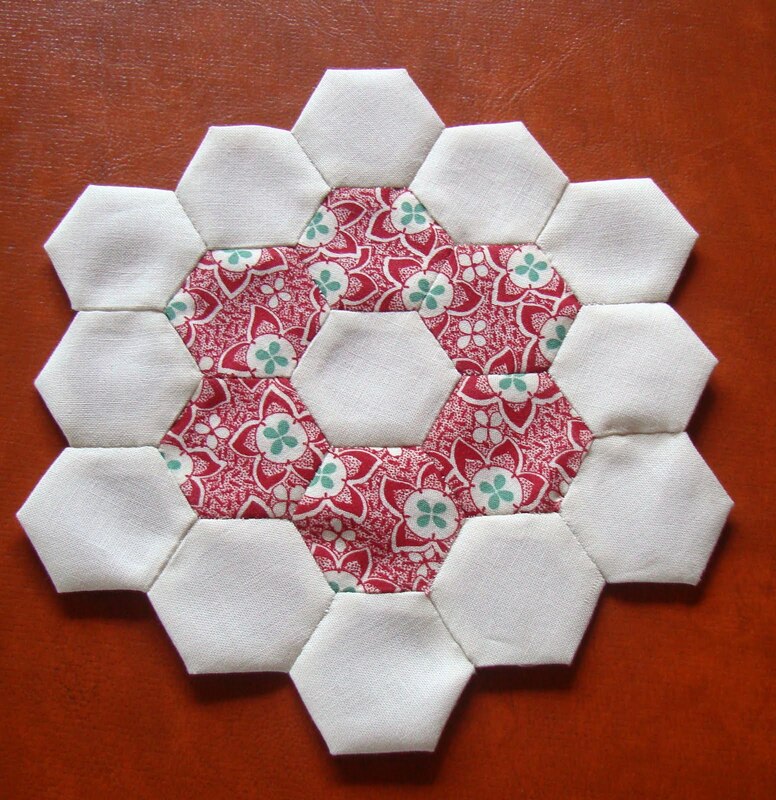 This year I ordered hexagons from Jackie of Canton Village Quilt Works. 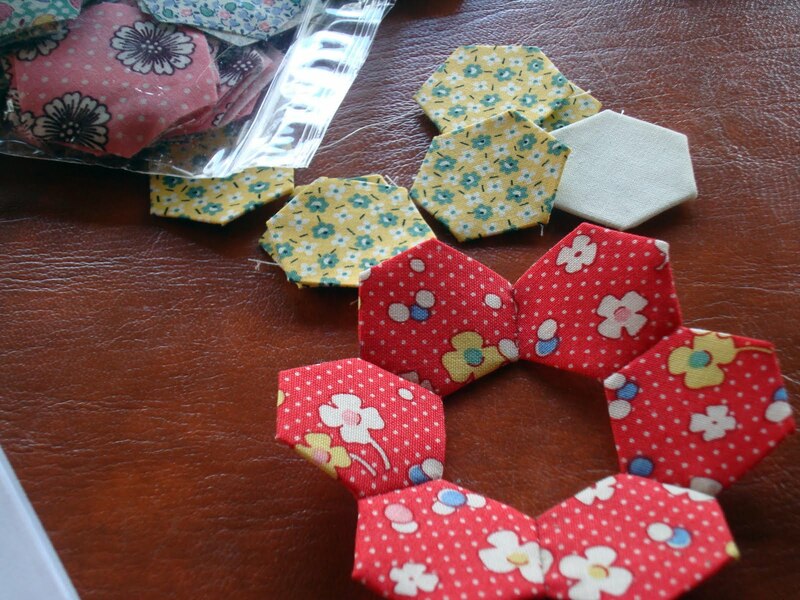 Jackie did such a great job with them using her Go Cutter. In fact she's having a giveaway on her blog right now for a Go Cutter. You can enter here. 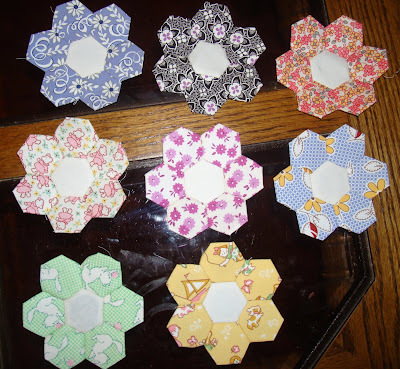 I printed off Lori's hexagon tutorial here. I had her cut a tan/linen color and 30's fabrics. 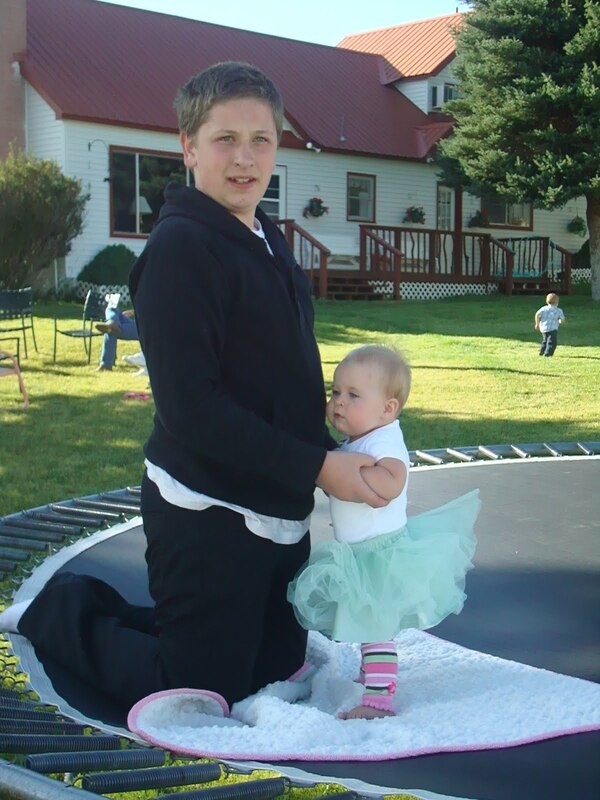 They were so fun to play with. These are my sister Michelle's hexagons. Here is Michelle showing our other project. Michelle wanted to learn more about machine quilting. So Saturday we took out her machine and went to work on some orphan blocks. 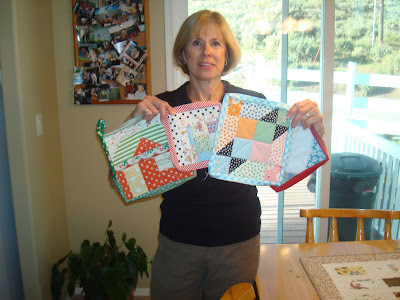 I think making pot holders is the best way to learn to machine quilt. 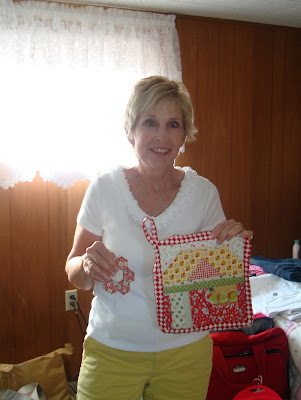 This is my sister Paula and her hexagon and hot pads. 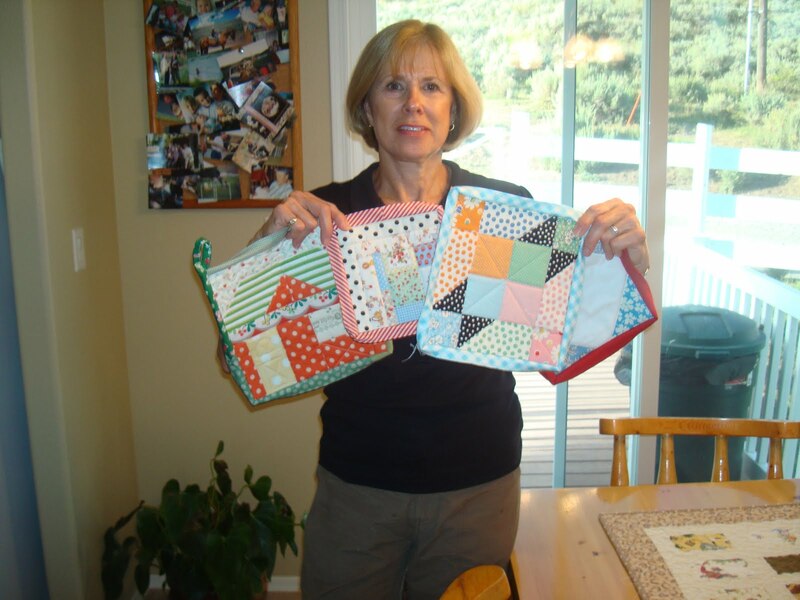 And this is my sister Teri and her hexagon and hot pad. 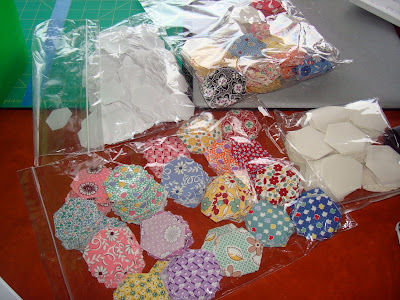 They are all ready for the girls to hand stitch the binding now. We used the heat resistant batting, too. So that's the highlight of our trip to Wyoming. 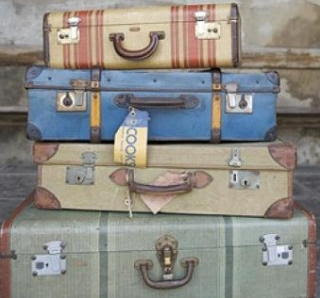 I hate to admit I haven't finished unpacking yet. The cold/flu stopped me in my tracks. Hopefully by next week I'll have made some progress with my projects and feeling back to myself so I can post and respond to email and make blog visits. Thanks for all your kind wishes and support. My blog friends are the best. P.S. This is my favorite Allison pic of the week. I'm home from my fun vacation but I brought home more than piles of laundry. I caught a cold while I was gone. 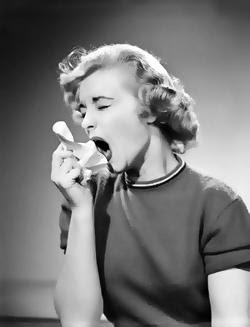 So it will take a few days to get rid of this annoying summer time sneezing and hoarse voice and get myself back to normal. Be back in a few days. I love being able to prepost or else my blog would be empty this week. Across the hall from the Quilt Show is the annual Art Show. 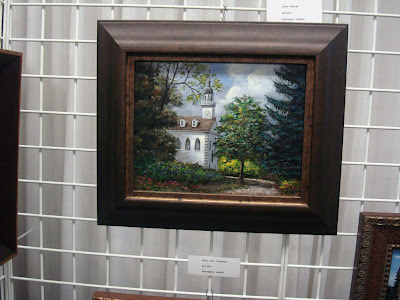 I always love to see what local artists are painting and making. 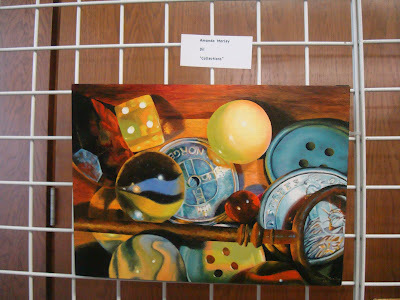 It was exciting to see so many young artists participating. 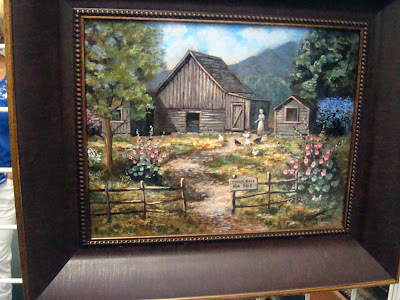 I loved this peaceful church scene and how it takes you back to simpler times. 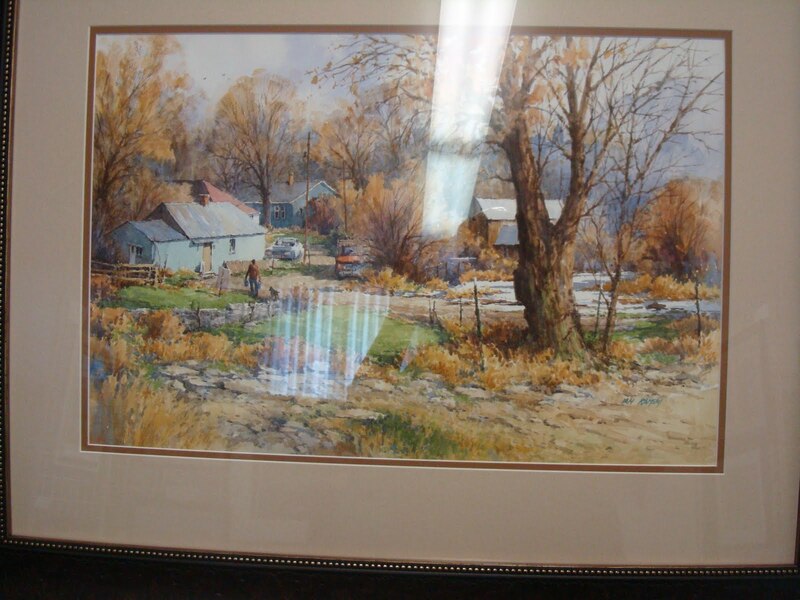 I love paintings of homes and barns. This one is a very pleasant farm scene. I absolutely loved this painting. Beautiful, captivating and spiritual. 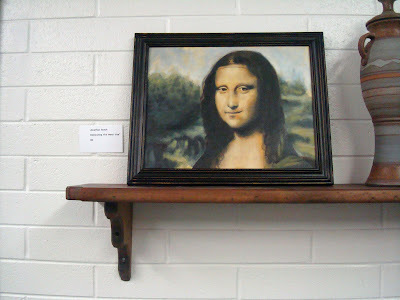 I thought this remake of the Mona Lisa was amazing. 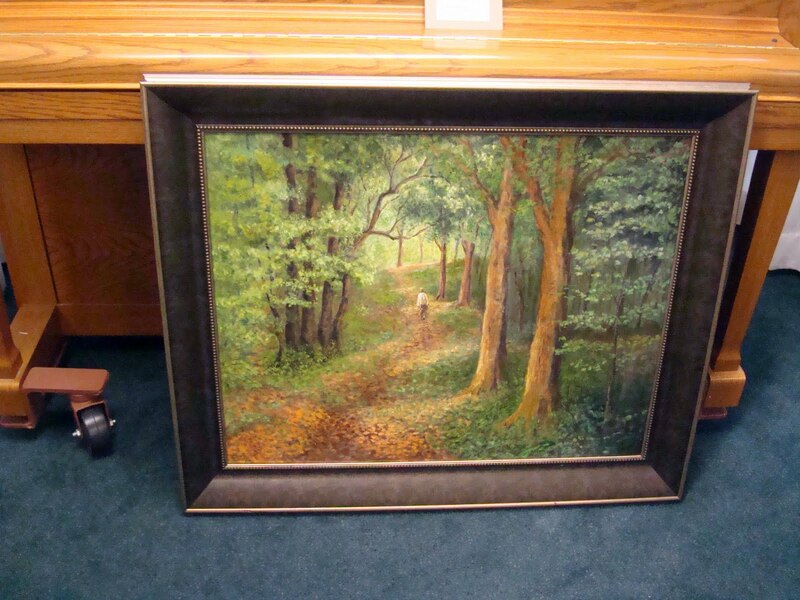 Who wouldn't want that hanging in their home? 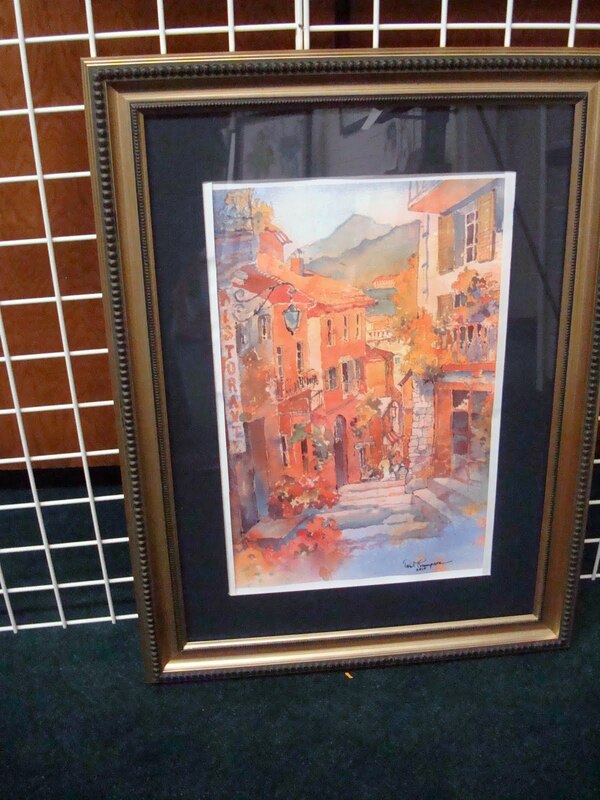 Love the colors and vibrancy of this piece. This was Natalie's favorite. 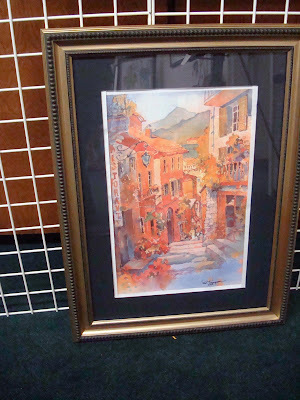 Art like this is very popular now she told me. I like it a lot. the detail is amazing and it really gives the eye so much to enjoy. This is a sneak peak into next week. I'll show you what I did just before I left on vacation. This is pretty darn frightening, don't you think! Stay tuned. This is my last post for the week. I hope I can get back to business quickly when I get home. I've gotta have patterns out by Sept 1. Meanwhile I'm still having fun. Hope I don't have a sunburn. 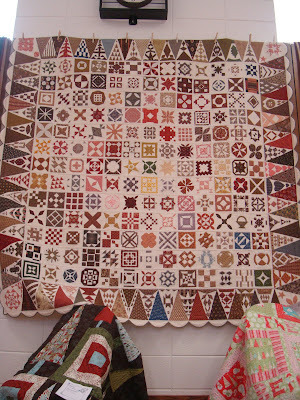 Okay more of the Alpine quilt show in the gym at the Old Red Church. I love that building. 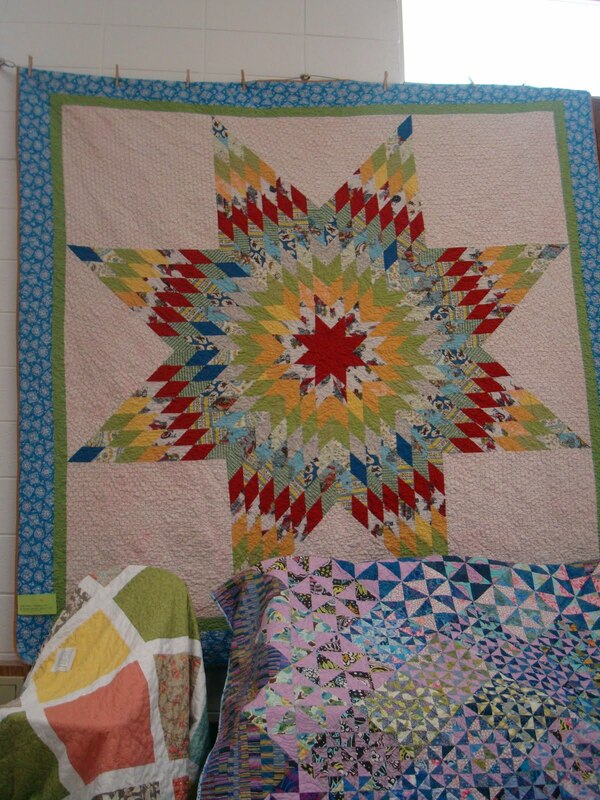 In the corner behind my basket quilt hung the Star wedding quilt I made for Natalie and Justin. I really really want to make another one of these. It was sorta stressful but I love the finished results. Across from that is my "Freda's Flowers". 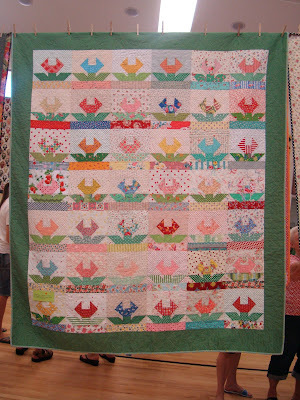 Seeing the legs under the quilts as viewers walk back and forth is kind of funny. Next to my Star quilt is Natalie's Bento Box. 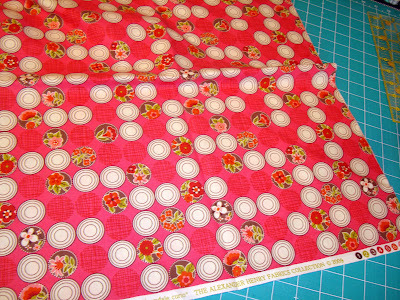 The binding turned out great and I love the colors and feel. 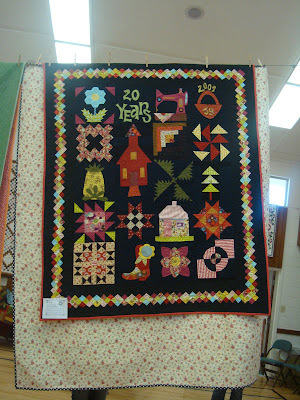 I love this vintage/traditional quilt. 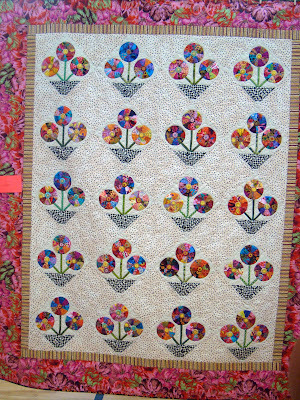 I was sure this was Janice M's quilt when I saw it. And it was. Janice does great work. Sigh. Whenever I see a Dear Jane I get a little wistful about my giving up. 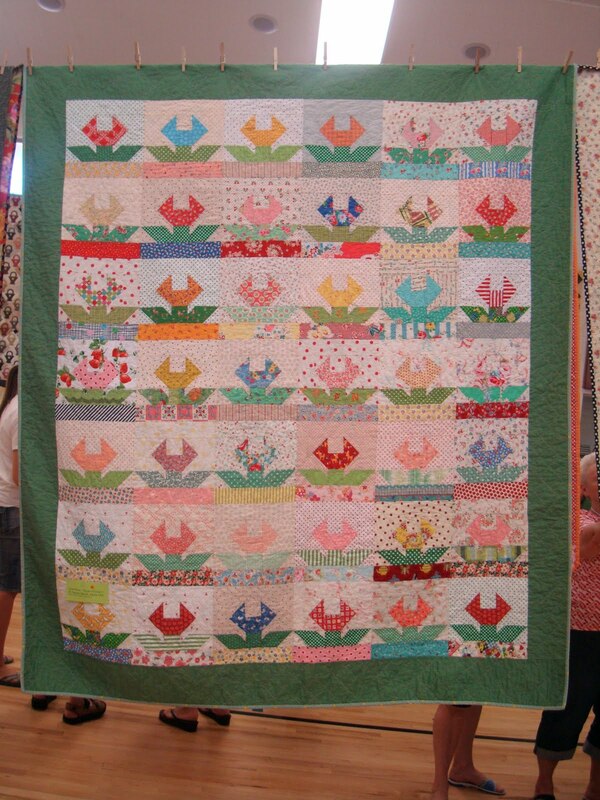 Cute quilts underneath, too. Here is the other twin to the Jan Patek (I think ) quilt. 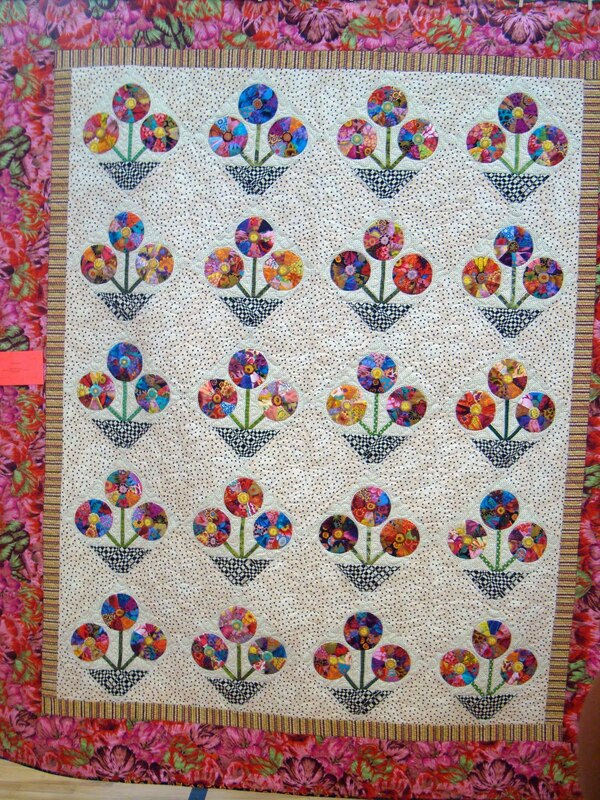 Jina Barney's 2009 Alpine Quilt. I LOVE THIS QUILT. The black is so dramatic in it. A great take on Trip Around the World. 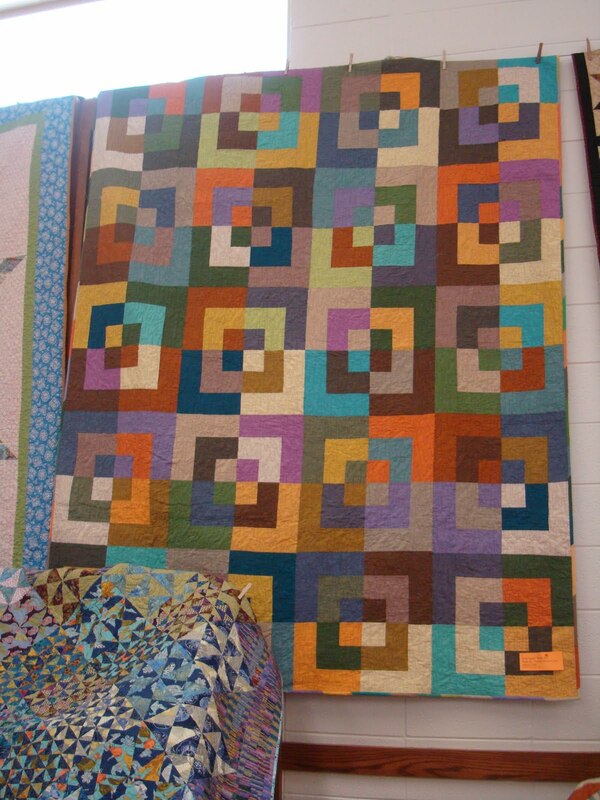 Someday I'm going to make a stained glass quilt. So interesting. I thought this leaf quilt was great and loved that it had non-fall colors. Isn't that an interesting Dresden Plate. This last quilt is made from traditional Japanese fabrics. I found it very intriguing. I'm sure I'm having lots of fun on vacation. Hope you are having a good week.